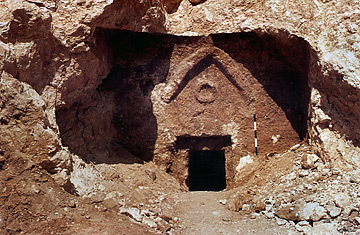 The entrance to a burial cave in southern Jerusalem is seen in this undated photo. Archaeologists and clergymen in the Holy Land derided claims in a new documentary, The Last Tomb of Christ, produced by the Oscar-winning director James Cameron, that contradict major Christian tenets. There were two types of fame on display at the press conference Monday morning in a grand, sky-lit room at the back of the New York Public library. There was director James Cameron, towering like a a six-foot-plus druidic monolith in a dark jacket and black turtleneck. And there was a light tan limestone box about two feet long lying on a table in front of Cameron  which the Titanic director was presenting as the burial box of Jesus Christ. All things being equal, we know who would be the bigger draw. (It was John Lennon who said he was bigger than Jesus, not Cameron, right?) But all things were not equal. Those in the room knew that Cameron was provably authentic. The other guy? Much more problematic. Cameron (acting as producer), biblical film documentarian Simcha Jacobovici and a handful of their expert consultants were at the Library to publicize Jacobovici's The Jesus Family Tomb, which will run this Sunday on the Discovery Channel, and a HarperSanfrancisco book of the same name. Their claim is that there was indeed a Jesus family tomb in what is now suburban Jerusalem: and that the two bone boxes on the table in front of them, exported from Israel, had contained the remains of Jesus and Mary Magdalene, whom the filmmakers assert was Jesus's wife and the mother of a son named Judah. Meet the Jesuses! Cameron told the press that when Jacobovici, who has been working on the project for years, laid it out for him in detail, he thought, "I'm not a biblical scholar, but it seemed pretty darned compelling." He added, "I said, this is the biggest achaeology story of the century. And I still believe that to be true." If true, of course, it is more than that. If true, it is a contradiction, in the most earthy, concrete way, of the Bible, which claims that Jesus was taken up bodily into heaven. But as its creators have revealed more and more of it over the last two days, key parts of it seem increasingly like debatable conjecture. Here's the set-up. In 1980 a construction crew in the Jerusalem suburb of Talpiot chanced upon a first-century tomb, which are not uncommon in that city. The Israeli Antiquities Authority found 10 bone boxes there, and stored them in a warehouse. Some bore inscribed names: Jesus, son of Joseph; Maria; Mariamene e Mara; Matthew; Judas, son of Jesus; and Jose. Each name with the exception of Mariamene seemed common to their period, and it was only in 1996 that the BBC made a film suggesting that. given the combination, it might be that family. The idea was eventually discounted, however, because, as University of St. Andrews (Scotland) New Testament expert Richard Bauckham asserted in a subsequent book, the names with Biblical resonance are so common that even when you run the probabilities on the group, the odds of it being the famous Jesus's family are "very low." University of North Carolina scholar James Tabor told him that Mariamene was the name some Christians gave to Mary Magdalene. If true, that added a rather uncommon name to the statistical mix. (Or as Cameron put it, "If you found a John, a Paul and a George, you're not going to leap to any conclusions... unless you found a Ringo."). Jacobovici also contends that "Jose," a name that appears in the Bible as that of one of Jesus's brothers, is rarer than previous scholars thought.  He came up with a new process called "patina fingerprinting," which purports to show that a different bone box that popped up in the hands of an Israeli collector some years ago and is alleged to have contained the remains of Jesus's brother James originally came from Talpiot, which would raise the coincidence level even higher. And Jacobovici managed to get tests done on DNA from the "Jesus" and "Mariamene" bone-boxes that indicated that they were not related on their mother's sides: therefore, Jacobovici quotes the DNA expert as saying, if this was indeed a family tomb, the two "would most likely have been husband and wife" (which is the source of his contention that Jesus and Mary Magdalene were married and that the Judah in the tomb was their son).  If "Jesus" and "Mariamene" weren't related matrilineally, why jump to the conclusion that they were husband and wife, rather than being related through their fathers?  The first use of "Mariamene" for Magdalene dates to a scholar who was born in 185, suggesting that Magdalene wouldn't have been called that at her death.  St. Andrews' Bauckham defends his probabilities, noting that Jacobovici was comparing his name-cluster to the rather small sampling of names known to have been found on bone boxes, while his own basis for comparison, which adds names from contemporary literature and other sources, makes the combo far less unusual.  Asbury Theological Seminary professor Ben Witherington, a early Christianity expert who was deeply involved with the James Ossuary, says there are physical reasons to believe it couldn't have originated in the Talpiot plot. Darrell Bock, a professor at the conservative Protestant Dallas Seminary, whom the Discovery Channel had vet the film two weeks ago, adds another objection: why would Jesus's family or followers bury his bones in a family plot and "then turn around and preach that he had been physically raised from the dead?" If that objection smacks secular readers as relying too heavily on scripture, then Bock's larger point is still trenchant: "I told them that there were too many assumptions being claimed as discoveries, and that they were trying to connect dots that didn't belong together."